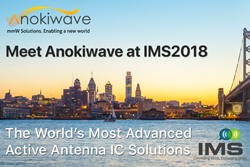 San Diego CA, 5 June, 2018: Anokiwave, Inc., an innovative company providing highly integrated IC solutions for mmW markets and Active Antenna based solutions, will continue its presence at the IEEE International Microwave Symposium with participation in the exposition at booth 538. Anokiwave is providing technology to commercialize active antenna phased arrays for mass market by reducing SWAP-C (Size, Weight, power and cost) for designs. Using silicon as the underlying technology, Anokiwave offers core ICs for 24/26 GHz, 28 GHz, and 37/39 GHz 5G communications, K/Ka and Ku-band SATCOM, and X-band RADAR. We also actively engage in custom IC development. Anokiwave senior staff will be present and available for meetings in our booth. To schedule an appointment us, please visit www.anokiwave.com/ims2018. Anokiwave has recently introduced its 5G Gen-2 ICs, supporting 3GPP compliance and its Intelligent Gain Block™ (IGB) ICs. The 5G-Gen 2 IC family now supports all major 5G mmW bands – 24/26 GHz, 28 GHz, and 37/39 GHz and is part of Anokiwave’s on-going strategy to enable the commercialization of 5G mmW systems with silicon ICs. The new IGB family of ICs offers versatile RF blocks that can be used for highly integrated millimeter-wave arrays (such as 5G, SATCOM, or phased array RADARs) or as a replacement of single function discrete blocks. The IEEE MTT International Microwave Symposium (IMS) is the premier annual international meeting for technologists involved in all aspects of microwave theory and practice. It consists of a full week of events, including technical paper presentations, workshops, and tutorials, as well as numerous social events and networking opportunities. For more information, visit www.ims2018.org. Anokiwave is a cutting-edge provider of highly integrated IC solutions that enable emerging mm-Wave markets and Active Antenna based solutions. Anokiwave’s creative system architectures and optimal selection of semiconductor technologies solve the toughest engineering problems.